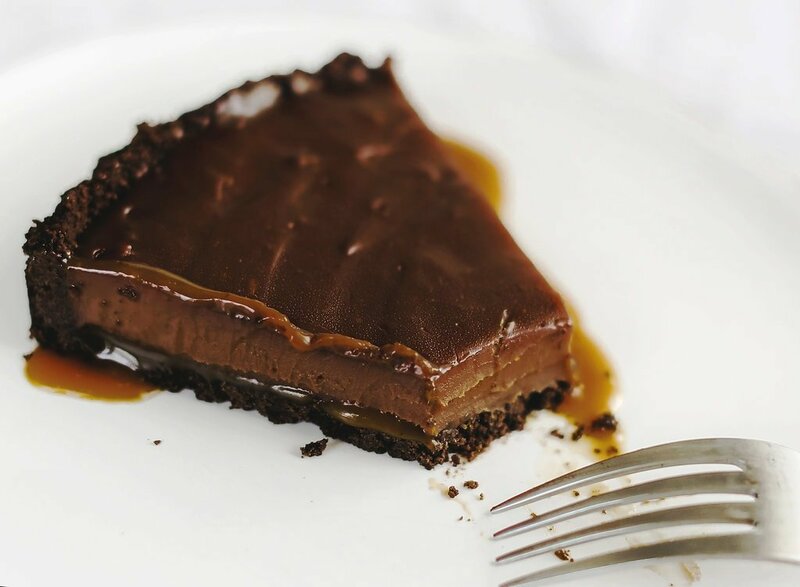 Nutella Caramel Tart features a chocolate graham cracker crust, a layer of hidden homemade salted caramel, and a rich Nutella fudge filling. Pure bliss! Taste: Like a candy bar in tart form! The combination of chocolate + caramel + hazelnut is insane! Texture: The crust is crunchy yet buttery, the caramel is luscious and begins to soften the moment you cut and serve it, and the Nutella filling is a mixture between rich pudding and ganache. Ease: This definitely takes some time to assemble, but the recipe is only one page long! Pros: Delightfully sweet and gourmet dessert. Cons: Should be served as soon as it’s sliced. Working under constraints usually results in the best type of creativity. When you don’t feel paralyzed by all of the endless options available to you, your mind automatically focuses in on the task at hand. When you’re working with just a few possibilities, you have no choice but to be creative. I actually learned this from my business coach. Some of the world’s top performers intentionally limit the amount of options and choices they encounter in their daily life, with big decisions, and while brainstorming new ideas, to avoid fatiguing their brains. I find some of my best recipe ideas come from those days when I open my pantry and use only what I have available to me. This particular tart recipe came from one of those days. I was cleaning out my baking equipment and found my tart pan. I realized I hadn’t used it in a while and forced myself to come up with a reason to. This tart is very rich and sweet. I call it a candy bar in tart form. Each bite is loaded with tons of flavor and texture, so you only need a small piece to feel satisfied. I just love how chic and gourmet a tart can look. That removeable bottom in the tart pan makes a world of difference in quickly slicing and serving to a hungry group! This is definitely a dessert to make the day before you plan to serve it. It requires at least 6 hours to set after it’s made. For the cleanest slices, definitely keep chilled until serving. Use a big sharp knife, and if you have the patience run it under hot water and wipe clean between each slice. The caramel will start to seep the longer it sits uncut, but I actually like how it looks. It gives you palate a sense of the rich sweetness that’s about to happen! The whole tart can be made and refrigerated up to 3 days ahead of time, but once cut the slices should be served immediately. If you make this Nutella Caramel Tart recipe, be sure to snap a picture and share it on Instagram, tagging #handletheheat. I love to see your creations, and often re-share them with the rest of my audience! The sour cream or yogurt helps to keep the caramel soft so it doesn’t turn hard once refrigerated, so don’t leave it out. In the bowl of a food processor, pulse the crackers, sugar, and salt until finely ground. Pour in the butter and pulse until evenly moistened. Pour the crust into a 9-inch tart pan with a removeable bottom. Press the crust into the bottom and sides of the pan. Bake for 7 minutes, or until fragrant. Allow to cool. In a medium heavy bottomed saucepan, add the sugar and water. Turn heat to medium high and cook without stirring until the sugar dissolves and turns a medium amber color, about 10 minutes. Remove from heat. Carefully whisk in the heavy cream, butter, and sour cream (the mixture will bubble up). Add in the salt and whisk until combined. Pour into tart shell and allow to cool in the fridge while you make the Nutella filling. In a medium saucepan, whisk together the cornstarch and a few tablespoons of the heavy cream to form a smooth paste. Gradually whisk in the remaining cream. Add the Nutella and salt and bring the mixture to a boil over medium heat. Whisking constantly, boil for 3 minutes or until the mixture has thickened. Remove from heat and stir in the vanilla. Pour over the caramel in the tart shell. Chill for 6 hours, or overnight, until the tart is set. The tart can be covered tightly and stored in the fridge for up to 3 days before serving. So happy you limited your options for this recipe and you found your tart form, this one is for me! Chocolate and salted caramel, best combination ever. A removable bottom? If you don’t have a tart pan could a 9-in springfoam pan work too? This tart looks perfect for my son. He has been wanting me to make him a chocolate tart and my first attempt failed. I think this nutella could be just perfect to make up for it! Oh! I love your tart. I want to ate it so much. There are several mistakes in this recipe. The directors tell you to pulse crackers with salt and sugar and yet salt and sugar are not listed in the crust ingredients. Likewise for making the nutella custard. Directions say add salt. There is no salt listed in the custard ingredients.